Toilets in an expensive new West Coast home should have worked – immediately. But after a few flushes, the master bath line backed up. Attempts to clear it repeatedly failed. And the construction company planned to replace a possible crushed line by jackhammering the structure’s concrete slab. Everyone feared the job would consume several days – until a seasoned drain-cleaning professional with the right equipment mix arrived. Oaks proposed pinpointing the clog with a Gen-Eye® video inspection/location system from General Pipe Cleaners. The latest Gen-Eye includes a self-leveling color camera that automatically keeps pictures right side up, letting professionals and customers clearly follow the action as the camera glides through the line. The Command Module includes a 10.4” color monitor and USB recorder in a padded carrying case, with telescoping handle and wheels for easy transport. 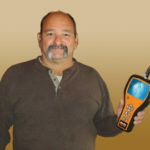 Completing system components is the Gen-Eye® Digital Locator, offering easy and accurate camera location and instant depth finding capability. Oaks fed the camera through the clean-outs, and discovered a 2-in. 45˚ ABS fitting wedged in the brand new 3-in. line. Oaks then had to eliminate the 45˚ ABS fitting. He quickly discovered that complicated line fittings prevented him from pushing the obstruction downstream – or upstream toward master bath clean-out. 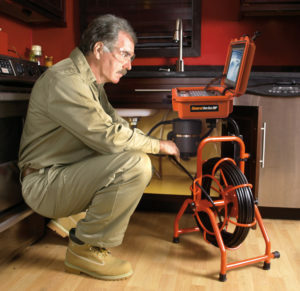 Oaks tapped the reach and flexibility of a Maxi-Rooter® drain cleaner. 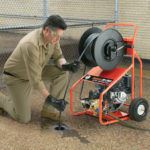 With a compact 23” profile, General’s lightweight, rugged machine features excellent maneuverability, high capacity and power cable feed rates ranging from 0 to 20 ft./min. 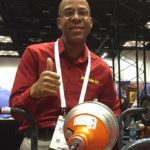 Lighter and more maneuverable than other drain cleaners in its class, General’s popular machine features a rugged chassis on 10” ball bearing, semi-pneumatic wheels with V-belt stair climbers for easier transport. Wheel brakes safely lock the machine in place during work or transport. Choice of cable proved paramount, too. The high capacity, removable Maxi-Rooter drum holds up to 125 ft. of tough, durable 3/4” Flexicore® cable or 150 ft. of 5/8” Flexicore® cable. Heavy duty wire tightly coiled around 49-strand aircraft type wire rope, Flexicore cable offers unequalled strength and flexibility. It carries a one-year warranty against defect or breakage – the best cable warranty in the business. “I couldn’t afford to break a cable and create yet another obstruction!” Oaks says. Oaks positioned Maxi-Rooter downstream – and a technician with the Gen-Eye camera tracking his progress upstream. Oaks methodically maneuvered the errant ABS fitting through the toilet opening, eliminating the costly, time-consuming headache everyone feared.